Marwa Ayad - The Official Website: Happy New Year! You've baffled me; you've impressed me; you've given me hope, and sometimes utter despair and hopelessness. You were certainly different, unexpected in many ways; and for that, you will be remembered for a very long time. Globally speaking, there were many natural disasters. I remind you again of the earthquakes in New Zealand, Turkey and Japan; the earthquake in Japan was one of the strongest ever recorded at 8.9 magnitude, triggered by Tsunami (think The Butterfly Effect) and lead to the Fukushima nuclear meltdown. And then the droughts in East Africa and the worst famine in decades. Then there were the floods in Thailand which affected more than 12 million people and killed over 800; and the typhoon in Philippines, more than a half million people lost their homes. Then there were also more than 300 tornadoes and blizzards in the United States ripping through the South East. 2011, you've outdone yourself, so don't pretend you have forgotten; the world certainly hasn't. 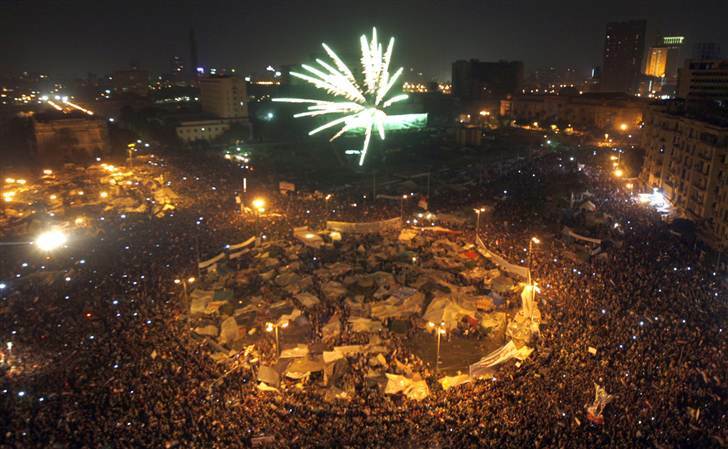 Politically speaking, it was the year of awakening for several Arab nations. On 14 Januray, 2011 the Tunisian government fell and then-President Ben-Ali escaped Tunisia after his infamous, or rather famous speech, often referred to as أنا فهمتكم ,or 'I've understood you' (addressing his people). My beloved Egypt and the Egyptian revolution which started on 25 January, 2011, almost a year ago, yet it hasn't been freed from military ruling, despite toppling Mubarak's regime on 11 February, 2011; and still protesters are getting injured or killed. The year Gaddafi was killed and Bin Laden was claimed killed/dead (I still doubt the death of the latter, let alone if he ever existed, but that's another matter), and Kim Jong-il (the North Korean supreme leader), Saudi Prince Sultan ibn-Abdelaziz, Egyptian writers Anis Mansour and Ahmed Bahgat, Egyptian singers Hassan Al-Asmar, Talaat Zein and Amer Mouneeb, Actress Hind Rostom, Actors Kamal El-Shenawy and Omar Al-Hareery died. The year Apple's Steve Jobs, Elizabeth Taylor and Amy Winehouse (the English singer) also died. The year of the English royal wedding. The year riots in England lasted for days and London was on fire. 2011, you were uncanny! On the personal level, it's the year I ventured away from home, seeking a new path, a new chapter in life. For me, things were rather quiet and I must say my times of solitude were very appreciated and needed. It was the year I made several amazing new friends and met lovely people. The year I discovered yet how fake some people can be, how intimidated some are by a feminine independence, difference and success. The year I realized it didn't matter how old someone can be, they can still be mean, and usually it turns back on them. Justice prevails, even after long years, Subhan Allah. The year I amazed myself at how I let go of many things that no longer belonged to me, and how I no longer needed to hold on to beliefs that hurt me and brought me down. The year I broke free. I used to joke that 2011 has hogged all the news, nothing will be left for any following years. I still think of you as the year of the Egyptian revolution; 2011, I still salute you. 2012, I have a lot of faith in you; please live up to it. I hope it will be a year of peace, and love, lots and lots of love, a year of justice, of seeking the truth, seeing the truth. A year of good change. I hope it will be the year my second novel is published (it's taking a lot of time to write, but it's a lot different than my debut novel and much longer). Happy New Year! And most importantly, happy new year, my Egypt!